Miku proceeded cautiously, quietly opening in early October and without much press until later in the month. It’s a smart move, allowing them to work out the kinks before the onslaught of diners arrive. With the size of their dining area, this will be important as the sheer capacity could easily overwhelm the kitchen. By our visit during the third week of October, I was impressed by the precision of their service: my reservation was in the system; the table ready and waiting; upon being seated immediately greeted and offered water; and drinks, food & fresh cutlery brought out in succession. The smoked soy grilled octopus ($19) offered a heavenly aroma from tender meaty tendril of octopus glazed in the slightly sweet sauce. In the middle, a piece of togarashi-dusted chicken skin, which worked with the seafood (perhaps similar to the bacon and scallop combination). Despite the plain looking dish, on the bottom was a delicious wasabi chimichurri that provided enough heat without being overpowering and went well with the octopus and tasty sides (wonderful roasted baby potatoes with a creamy centre and tiny roasted cauliflower florets). I wasn’t sure what to expect from the Kaisen soba pepperoncino ($28) but it was fantastic. Laced with a chili-garlic soy, the buckwheat noodles were tossed in the flavourful sauce adding a stir fried quality to the dish. 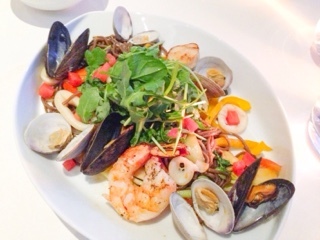 A selection of Oceanwise seafood accompanied the noodles: a single prawn and scallop (despite the plural form used on the menu) were a fair size and cooked wonderfully; the calamari rings meaty and delicate; but the clams and mussels a bit overcooked. Bell peppers, crunchy bok choy, prince mushrooms were also included to add contrast and colour. However, I could have done without the make shift salad on top – the arugula was bearable, adding a peppery freshness to the noodles, but the diced tomatoes rather strange. 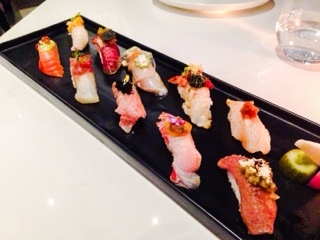 Of course, we couldn’t visit without trying the aburi prime ($55 for 10 pieces), a chef’s choice nigiri selection. 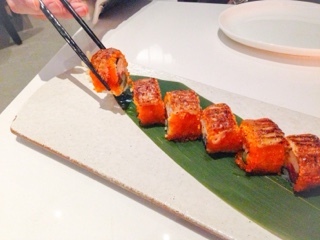 Aburi is essentially lightly blowtorching the ingredient to help warm and release an extra boost of aroma and flavour. 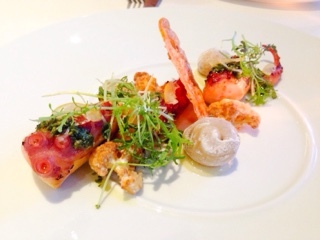 Each piece was then carefully paired with sauces and garnishes to best showcase the ingredient. Understandably, there was no chance in me remembering all the combinations as they were listed out, but since it’s supposed to change depending on ingredient availability, you’ll likely have something different anyways. It was beautifully presented, thanks to head sushi chef Kazuiki Uchgoshi and his team, with each piece an art form of its own. At first, we had intentions of cutting the sushi to try them all. However, after seeing the intricate placement and knowing all garnishes are required to get the intended taste of the sushi, my husband and I each chose five. The lobster tail was substantial and its sweetness apparent (especially on the thicker end) and well matched with a tangy sun-dried tomato. Since it was cooked rare, it did have a gummy texture I’m not particularly fond of but wasn’t off putting either. Reminding me of an upscale Big Mac, the wagyu was delicious with the well-marbled beef melting on the tongue and topped with a pickled tartar sauce. I also consumed two pieces of rather neutral fish, which were both good. Admittedly, one wasn’t overly memorable, but the other that was paired with prosciutto was yummy, the meat adding a strong saltiness against the delicate fish. The most disappointing piece was the squid, which was somewhat hard and had an awful fishy aftertaste that had me reaching for my shiso mojito ($15). Overall, the aburi prime was fine but not as impressive as one would think from a dish that is described as “prime”, “omakase” and “premium”. 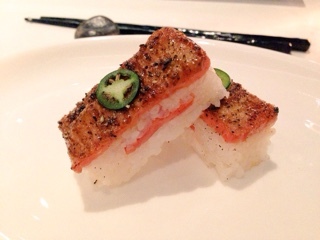 Although it’s been touted that Miku brought the aburi method of cooking to Toronto, in reality it’s been around for years (my first experience during a dinner at Ja Bistro). 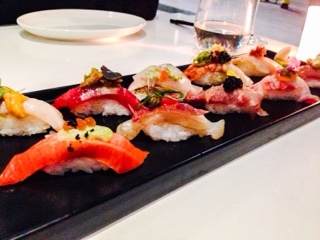 On the nigiri selection, it was done so lightly that I really couldn’t notice a difference. Moreover, the rice itself could be improved – being warmer and incorporating more vinegar – as we found it rather tasteless if not for the plethora of ingredients on top. Personally, I found the salmon oshi sushi ($17 for 6 pieces) did a better job at highlighting the aburi method, helping to release the fish’s oils and melting the Miku sauce. Our waiter advised that only seven people at the restaurant are told the ingredients for their namesake sauce, even then each only knowing certain ones so it becomes a team effort to make it. To me, it tastes like a kewpie mayonnaise with butter. 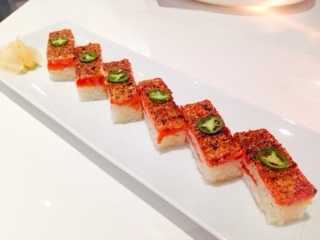 Slices of BC wild sockeye salmon is sandwiched in the pressed sushi and on top, which was an ingenious idea to add a richer flavour as the two layers of salmon permeated throughout. The layer of cracked black pepper between the salmon and sauce also helped add an interesting heat that’s different from the jalapeno. 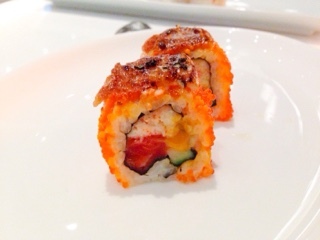 The Miku roll ($22 for 8 pieces) incorporated tons of tobiko (fish roe) giving it a beautiful vibrant hue. We should have read the menu carefully as this also had the Miku sauce, which after the salmon was too heavy and similar. In this case, the crab, uni and salmon within the maki became lost amongst the smoky torched sauce and flavourful tobiko. Miku’s green tea opera cake ($13.50) has a bit of everything in it, with the matcha flavour found in the sponge cake, butter cream and ice cream. The cake also included layers of silky dark chocolate ganache, a thick adzuki bean paste and crunchy hazelnut wafers. 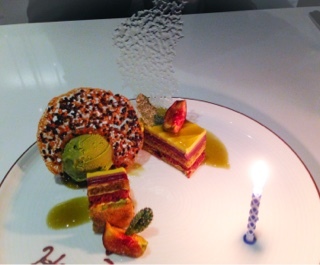 It was rich and delicious, having an almost Kit Kat essence within the dessert. Walking into the cavernous white dining room, you wouldn’t think you’re at a Japanese restaurant. That is, until the hostess gets everyone’s attention and the kitchen greets you in unison. It’s a stunning space that marries simplistic Japanese décor with modern European elements, much like some of the items on Miku’s menu. Moreover, it’s great for large groups and a good choice for those who want upscale Japanese without the traditional elements (everyone speaks English and you don’t have to use chopsticks). Another Vancouver exports joins the Toronto scene, welcome to town!